Cheena are the raw, snotty downtown New York circa ’77 band most of us never got to see. They’ve got a little bit of New York Dolls swagger, a dash of Gun Club style Western guitar, and a whole lot of rock ’n’ roll attitude. They’re also a modern NYC supergroup of sorts, featuring members from a couple of the city’s finest underground bands, Pharmakon and Anasazi. 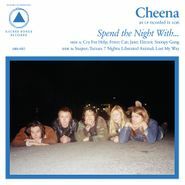 (Both those bands are affiliated with the always ace Sacred Bones Records, as is Cheena’s debut LP, if that gives you a better idea of what you’re getting into.) Spend the Night With... is essential listening for those summer nights where it’s too hot to do anything but crack open another cheap beer, throw on your most breathable leather (or denim jacket), and go sweat it out to some raucous, party-bringing punk rock.